Known for directing crime-infested thrillers like Hana-bi and even starring in the gruesome Battle Royale, Takeshi Kitano (also known as Beat Takeshi) takes a step in another direction with this introspective family tale. Kikujiro is a Japanese film from 1999 that focuses on two unlikely characters as they set out on an even more unlikely summer adventure. One is a quiet boy who lives with his grandmother and wishes to find his long lost mother, with only a photograph as a clue of her whereabouts. 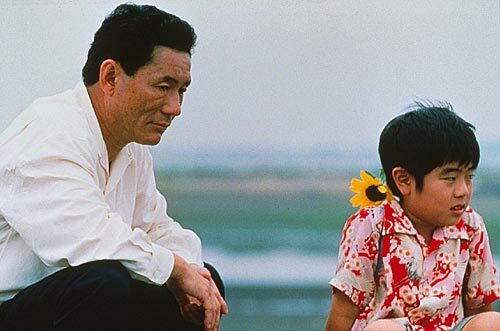 The other is the boy’s neighbor and an ex-yakuza member, played by Kitano himself, who is forced by his wife to accompany the boy on his journey. 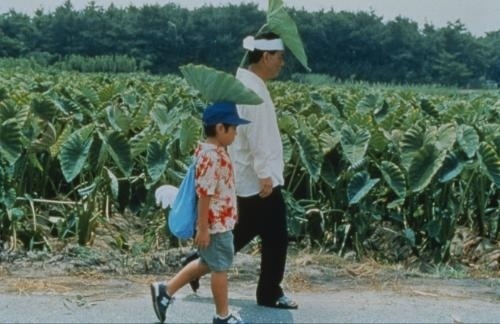 The narrative unfolds in a series of vignettes, as the boy and Kitano’s character travel across the country in hopes of reuniting the boy with his mother. Of course, no impromptu quest is complete without meeting strange compatriots. The two find themselves encountering the strangest assortment of faces along the way. It’s these meetings that provide much of the film’s personality, and the fact these characters are so outlandish lends itself to the overlying themes. They say that it’s okay to be different from what’s deemed as the societal norm. This drive to find a place to belong and to not be alone. This is what ultimately drives the boy, and even the man, on their quest. All the people they meet along the way have their own interesting quirks to them, from a woman who likes to juggle to a man who’s a little too willing to get naked for the sake of entertainment (that sounds so strange out of context). Sounds a lot like The Wizard of Oz, huh? Like in Oz, all of the characters are on the road towards a destination without really knowing what they want. All they know is that want to go somewhere. While they do end up getting reward for their quest, but of course the real reward is the journey itself. That’s the true essence of an adventure, right? A lot of the emotions that are exuded from the film aren’t generated by dialogue, but rather the subtle actions of the characters as well as the cinematography. Much of the dialogue between the man and the boy is accompanied by long and sometimes even awkward pauses, which emphasizes their strained and uncomfortable relationship and the distance that separates the two. This unsettling atmosphere is further enhanced by Kitano’s constant limp and eye twitches. There are also a good number of scenes of the two walking. In fact, scenes are often extended just to show the two walking away, showing that their journey is not only physical one but also a silent internal one. Kitano goes a great job playing his character, spanning a wide variety of emotions. In the beginning, he acts as an irresponsible adult, not really knowing how to interact with the boy. Most of what he does is so outrageous and hilarious. 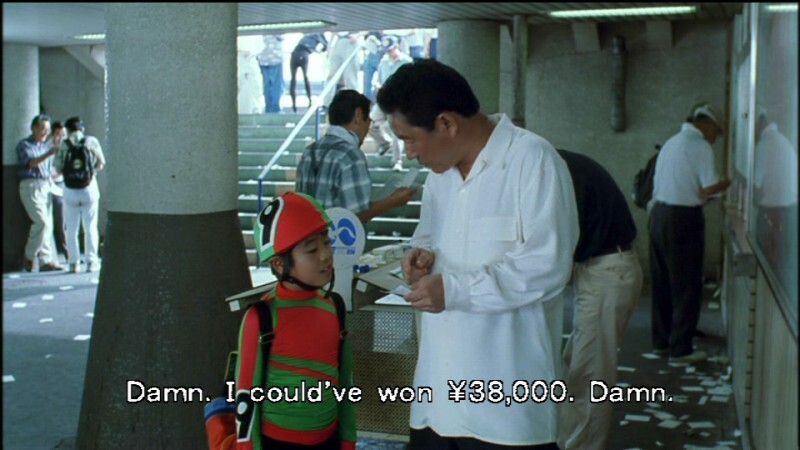 He even forces the boy to help him with his gambling addiction! This is a result of him not having children of his own, as well him having a broken family as child too. As time goes on, Kitano’s character realizes just how similar he and the boy actually are. In the end, the man sincerely begins to care about the boy’s emotions because he sees so much of himself in him. On their journey together, they help each other grow, especially Kitano’s character. You’ll watch as he grows from an irresponsible lowlife to a slightly less irresponsible father figure, and you’ll learn that families can come in all shapes and sizes. The music is written by Joe Hisaishi, of Studio Ghibli fame, and is one of the reasons I found out about this movie in the first place. “Summer,” the main theme of the film embodies the many emotions of the season. In the piece, the piano dances amongst the structural string parts, as worldly connections that hold us down are cast into wind in favor of an adventure under the summer sun. “The Rain” is another amazing track that has a violin and cello echoing identical parts. It represents the often unspoken struggle that’s shared throughout the film between the boy and the man and plays at the point when their troubles have reached their lowest point. I feel like crying every time I hear it because it speaks volumes about a child’s innocence, that’s in danger of being destroyed all because of realizing something that he may have never wanted to know. Then, it’s like the lower cello part joins in to gently say, “I know how hurt you are, because the same thing happened to me, but I can promise you that everything’s going to be okay.” Surely enough, things turn out fine as the music transitions back to the pleasant “Summer” theme. These complex and sympathetic themes in Kikujiro are presented in a very simple package, flowing along at an easy pace just as a summer’s day would. The long pauses and extended walking scenes give plenty of time for the viewer to contemplate their own lives and even their own families. The silly behavior of the man (whose name you won’t even learn until the film’s end), keeps things from ever becoming too sad. The actions by him and the rest of the interesting cast help to create unforgettable summer memories for both the viewer and the boy. You’ll be reminded, like the boy and the man, that you don’t have to be blood to be family. If you feel like you belong, I think that’s all that matters. I love this movie. I first saw it on the independent movie channel years ago and eventually had to buy the dvd. That scene where they find the mother… I cried so hard. This is really a great movie. Yeah, that scene hit me pretty hard too, and I think it’s the music that makes it as emotional as it is. The more I think about this film, the more I remember how great it is. This is one of my favorite movies. I picked it up on a whim years ago at a local movie rental place and just loved it. The relationship that spawns between the two characters hit me right in the feels. The growth of their relationship just feels very natural, and yet the over the top trouble they get into is so funny. The movie has a great balance between emotional drama and silly comedy.